Since Donald Trump took office, Immigration and Customs Enforcement officials have ramped up the odious practice of targeting courthouses to find and arrest immigrants. As the Intercept reported on Monday, new information released by the Immigrant Defense Project presents a more detailed picture of what this has meant in the past two years in a “sanctuary city” like New York. A young man and his mother had just left the Brooklyn Criminal Court after the man’s appearance in court. 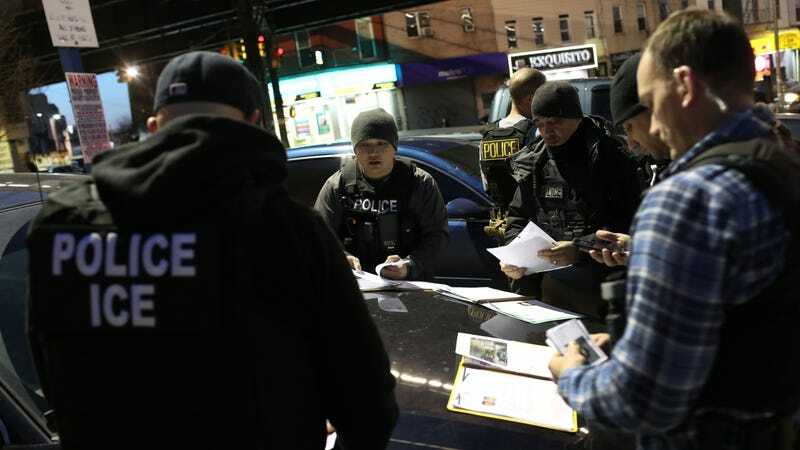 About a block from the court, two plain-clothes ICE officers appeared out of nowhere, grabbed the man and started to drag him towards an unmarked car. Thinking that her son was being kidnapped, the mother repeatedly asked who the agents were. The officers refused to answer her and when she asked if they were immigration, the officers said no. As the mother cried for help, a third plain-clothes ICE officer came over and pushed her against a wall, causing her head to hit the wall. The officer repeatedly told her to “shut up” and physically blocked her from going over to the unmarked car where her son had been pushed inside. The officers then drove away, leaving his mother sobbing on the street, panicked that her son had been kidnapped. It wasn’t until the following day when her son called her from the processing facility that this mother knew he had been taken by ICE. This is only a small slice of similarly punitive courthouse arrests happening around the country.